I always knew I wanted to study abroad after completing my bachelor’s degree, but deciding where to go was the most difficult part for me. Luckily, one of my Internet research sessions led me to find Across The Pond. With the help of my advisor I found several schools in the UK that offered graduate programs I was interested in. I applied to several programs, but finally decided to attend Oxford Brookes for their MA Publishing. Oxford Brookes appealed to me for a number of reasons: their student satisfaction rating was very high on a number of different websites, the lecturers on the publishing program had a history of industry experience, and the modules listed for the degree seemed directly relevant to the field. I wanted a master’s program that would help me gain industry experience as quickly as possible, and the Brookes MA has really lived up to my expectations. Already by the end of my first semester I had secured a work experience placement. I have since also acquired two volunteer positions related to publishing. If you want to learn the skills you need to be a publisher and have supportive teachers and advisors to help you get experience in the industry, I’ve found both through the MA Publishing at Oxford Brookes. Some of the courses I’ve taken for my MA include an editorial module (with a proofreading tutorial), a marketing module, and a module covering design and production for publishing. In my second semester I am currently studying my elective modules: New Product Development (an editorial-based course), Rights Management, and Children’s Publishing. During this semester we are also required to submit a proposal for our final dissertation or major project that will be completed over the summer to finish the course. 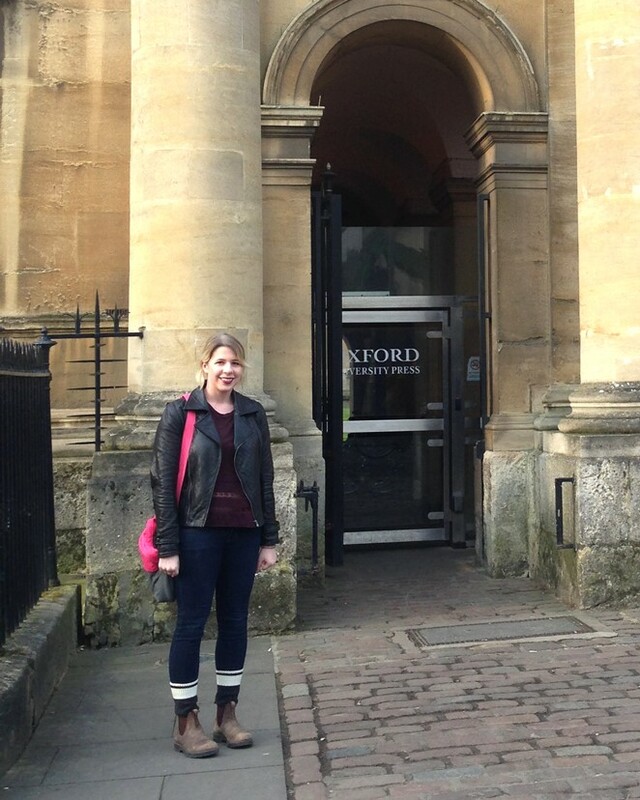 I moved to Oxford just a week before the start of classes for my degree, in mid-September. I found it to be a beautiful city full of old buildings and rich history, and also quite a change from the busy urban setting where I had studied for my bachelor’s in Canada. While it may not have all the amenities of a big city like London or Toronto, the transit is easy to use, the city centre has decent shopping and there are loads of nice places to eat. Oxford may not be a big city, but it is a very expensive place to live. Once you add up the cost of rent, utilities, food, and a transit pass, staying in residence starts to seem a little appealing. The postgraduate residence where I chose to stay (Clive Booth Student Village) ended up being the most cost-effective for me as the fees covered everything from Internet to a local bus pass, plus the location was close to all of the campus sites I needed to access for classes. One of the nice things about my program in particular is that we are offered the chance to participate in school-coordinated travel to book fairs all over Europe. I had a chance to attend the Frankfurt Book Fair in Germany, and I will also be attending the Bologna Book Fair in Italy later this year. There are lots of places to see near Oxford as well, just an hour or two away by bus or train. Many of my classmates go to Bath on weekends, or take the bus to London. If you’re from Canada or America where the norm is traveling for a long time but getting nowhere, the UK is a pleasant change, because a two-hour train ride can get you to Paris! Travel is definitely one of the perks of studying in the UK… when your classes afford you the time, of course. Everything about moving from Canada to the UK was a big step for me, and working with an advisor from Across The Pond helped ease the process a little bit. It was reassuring to know I could ask my advisor whenever I had a question about my school choices, my applications, or my VISA, and I would always get a prompt response. I also found the documents provided to me just before my move, like the Pre-Departure Guide, helped prepare me a little more for what life would be like in England. To any new student looking to study at Oxford Brookes, my advice would be to put yourself out there! Especially in the field of publishing, meeting people is the best way to gain experience, learn new things, and get access to resources (for example, those sought-after internships)! There are some really good resources available at Brookes, from the lecturers themselves to the careers centre, librarians, and the Brookes Union. If you’re going to make an international move for school, make the most of all the new experiences, and talk to people! It can be hard to be sociable at first in a new place surrounded by new people, but I found the MA Publishing students to be a very international and very friendly group. Taking a risk is worth it!